If you’re not a hard-core car enthusiast, you may not understand all of the maintenance that needs to happen to keep your vehicle running at its best. One important process that you might not realize your vehicle needs is brake caliper servicing. You may be wondering what brake calipers are! Brake calipers house the brake pads and, using brackets, pistons and caliper slide pins, help push the pads into the brake rotors when you apply the brakes. Over time, the slide pins lose their lubrication and don’t slide the calipers so well. This lack of lubrication causes a few things to happen. 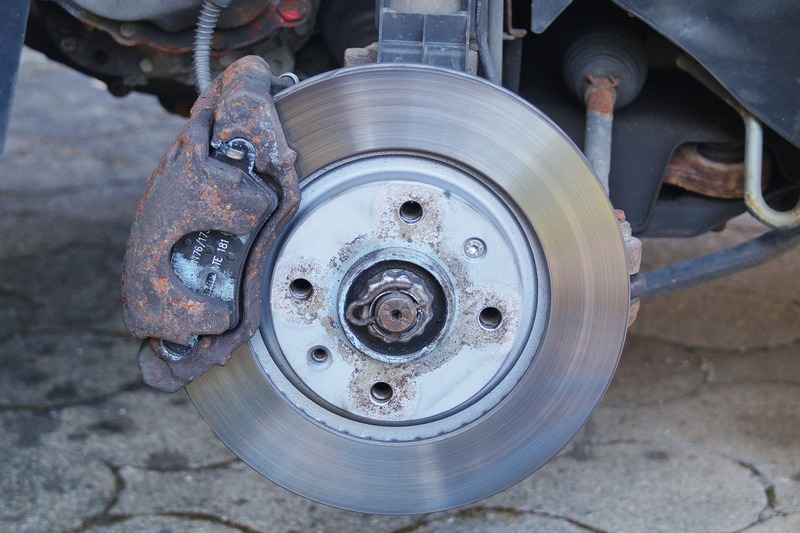 First, because the brakes don’t contact the rotor properly, your brake pads can wear unevenly. Second, the slide pins may stick, causing the brake pad to continually contact the rotor, resulting in a buildup of heat, which wears your brake pads down faster. Third, your brake’s stopping power may be weak due to the brake pads not hitting the full surface of the brake rotor. All this means you aren’t getting the full use of your brake pads as you should, which means money wasted. While there is a rubber cover protecting the slide pins, they experience brake dust and rust buildup, which hinders the calipers from sliding. Rust occurs in areas where salt is put on the road. The chemicals from the salt are harmful to metal and can be corrosive if the metal is not cleaned regularly. This corrosion contributes to the problems resulting from a lack of lubrication. Servicing your brake calipers includes cleaning and lubricating the slide pins. We clean the pins to remove any grease or debris and inspect for rust. We then apply a heat-resistant lubricant on the pin and slide it back in, which should easily slide. This process takes a little under an hour, and we can inspect your vehicle’s disc or drum brakes, too, while we’re at it. If you don’t know when your brake calipers were serviced last, it’s not possible for us to know if they need to be serviced without taking apart the brakes, and, in that case, since the brakes are already apart, we suggest that we go ahead and clean your slide pins. From that point on, you should have your calipers serviced on a set schedule, depending upon the area you live in. If you live in Wisconsin, Minnesota, or another snowy state, you want to clean your calipers every 1 to 2 years. For those who live in drier places, such as Texas or Arizona, you probably never have to worry about your calipers. Next time you’re in for service at Weber Automotive, ask us to take a look at your brake calipers. We can help you save your brake pads, which in turn, saves you money and gives you peace of mind knowing that your brakes are working correctly.